"Bite-sized chunks of chicken simmered in a traditional pasta sauce with bell peppers are served over piping hot brown rice." Mix together a large pinch of salt and pepper with the flour in a large bowl. Add the chicken pieces and toss until evenly coated with flour mixture. Heat olive oil in a large skillet over medium-high heat. Cook chicken for about 4 minutes, turning well so each side is evenly browned. Remove to a plate. In the same skillet, saute the pepper, onion, and garlic until the onion is soft and translucent, about 5 minutes. Add wine and chicken broth; simmer until it is reduced by half. Finally, pour in the tomato sauce and add the browned chicken pieces. Simmer for 5 minutes, or until thickened. 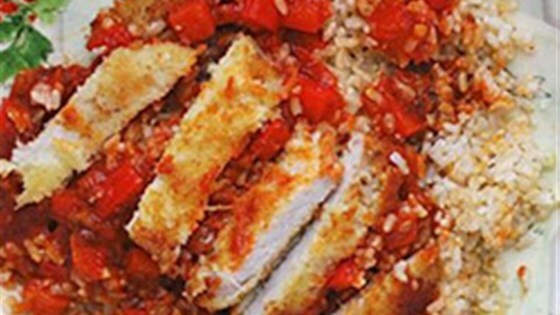 Divide the rice into four deep bowls and top with even amounts of the chicken cacciatore. Serve hot. Molto Bene! Delicious, easy one skillet cacciatore.